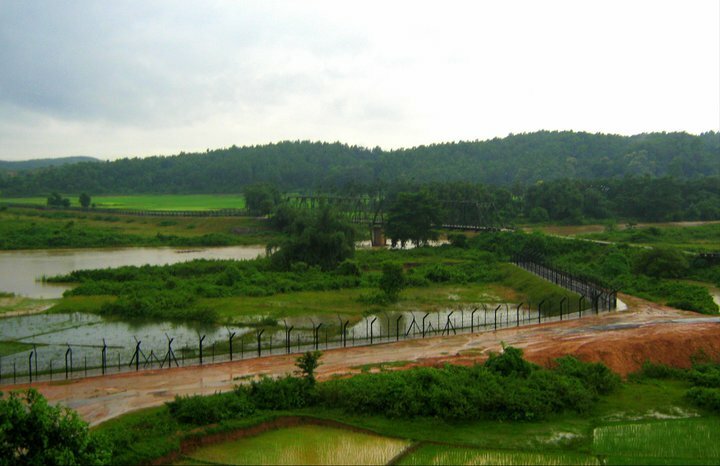 India shares its longest border with Bangladesh. This 4351 Kms long border stretches along 5 Indian states, namely West Bengal (2217 Kms), Assam (262 Kms), Meghalaya (443 Kms), Tripura (856 Kms) and Mizoram (318 Kms). 781 Kms of this border is riverine. 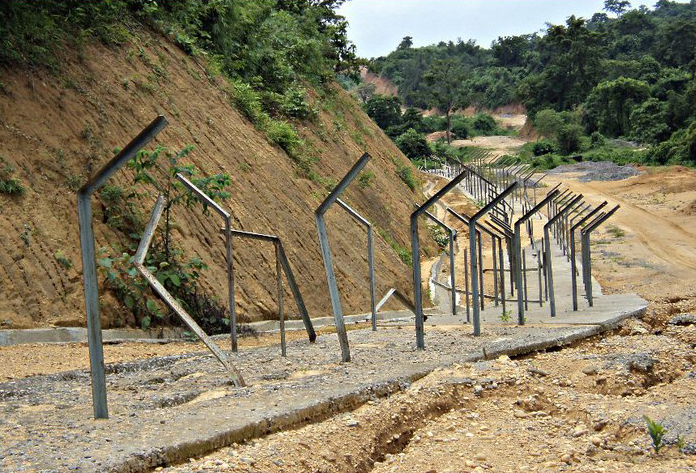 This long Indo-Bangladesh border is guarded by the Border Security Force (BSF), an Indian central paramilitary force under the Ministry of Home Affairs. 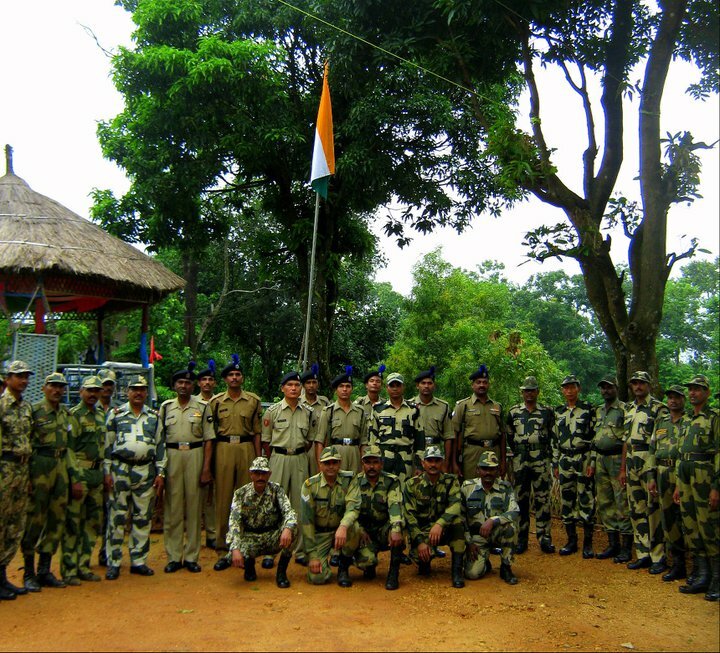 The BSF has about 46 battalions deployed along this border divided into formations controlled by 5 Frontier Head Quarters: South Bengal Frontier HQ, North Bengal Frontier HQ, Assam-Meghalaya Frontier HQ, Mizoram-Cachar Frontier HQ and Tripura Frontier HQ, each headed by an Inspector General. Under each Frontier HQs are Sector HQs each headed by a Deputy Inspector General. 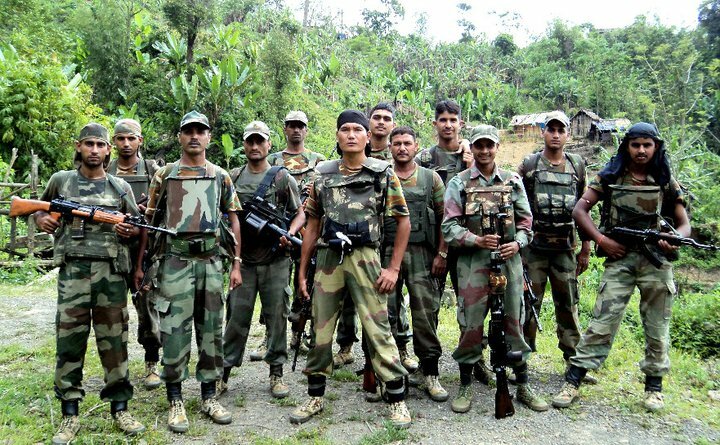 The Assam-Meghalaya Frontier HQ shall soon be bifurcated into the Assam Frontier HQ and Meghalaya Frontier HQ and new sectors curved out and new battalions raised to enhance force structure and improve border management. 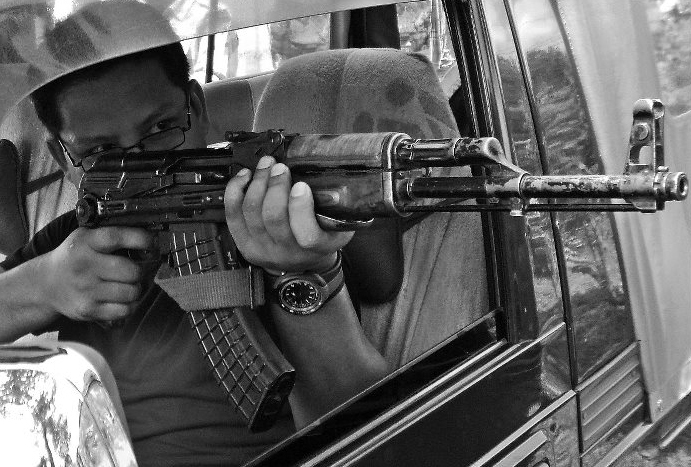 The border is guarded on the side of Bangladesh by its paramilitary force the Border Guards Bangladesh (BGB). BGB is the erstwhile Bangladesh Rifles (BDR) which has been re-raised in this new form after the infamous 2009 mutiny by the BDR. Its battalions are deployed along the border across 12 sectors. A large stretch of the Indo-Bangladesh border has already been fenced off by India, primarily to prevent illegal immigration from Bangladesh as well as infiltration of non-state elements inimical to India which had earlier found sanctuary in Bangladesh, including several insurgent groups of India’s North East. The border fence, due to treaty obligations, has not been constructed on the ‘O’ line, where the actual border lies, but 150 yards or more inside Indian territory, as necessitated by terrain and other deciding factors. 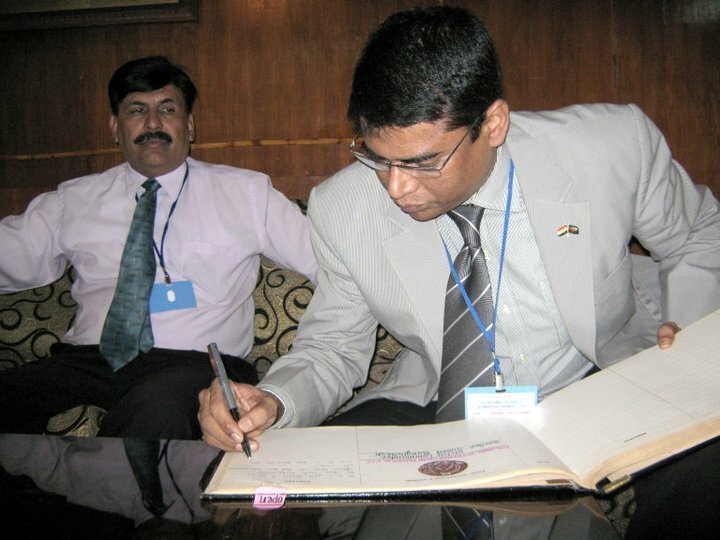 The several areas of the border, which had been in dispute, has now been surveyed and demarcated for settlement by the recently concluded treaty between the two countries. 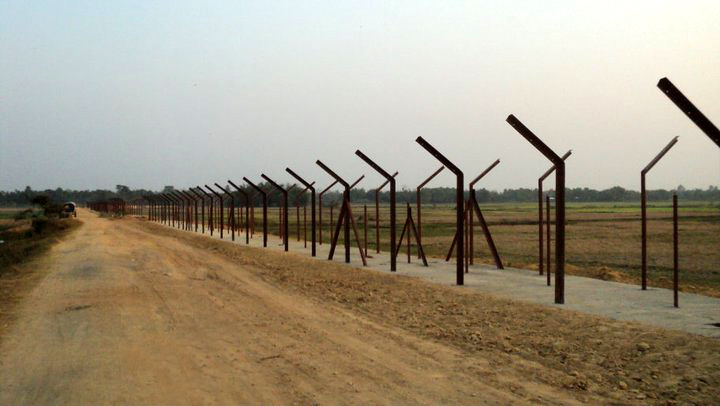 The Indo-Bangladesh border fence under construction at a sector. 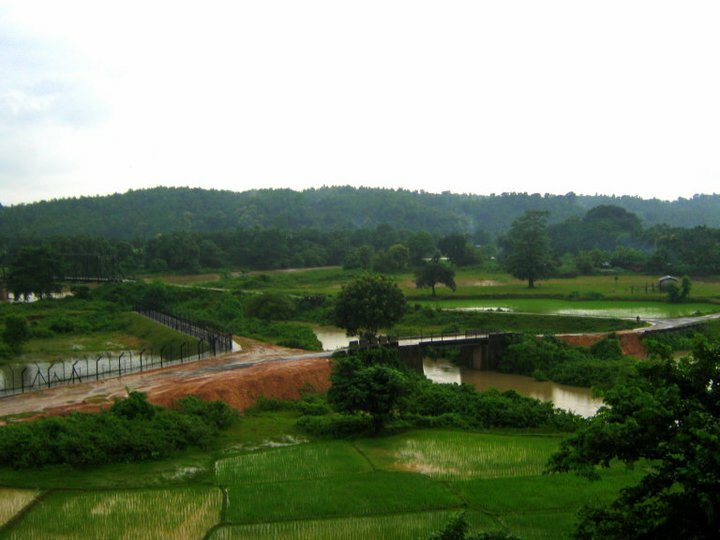 A glimpse of the border with verdant green paddy fields on both sides. Bangladesh starts just on the far side of the fence. Another view of the border. It is not only humans who infiltrate and exit through the border, but also wildlife. 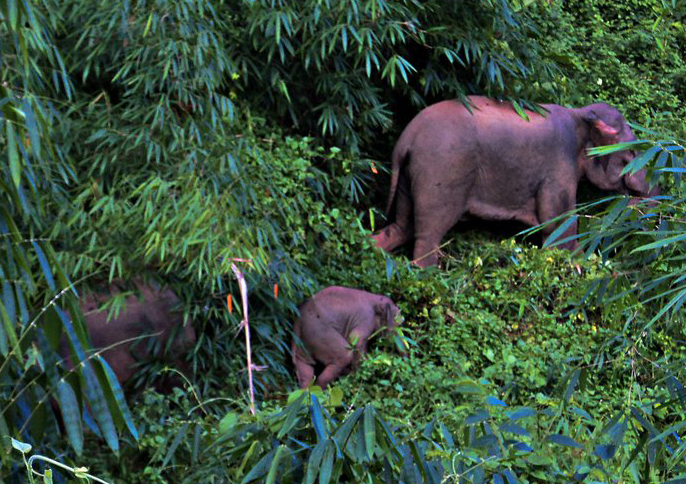 The border fence has obstructed traditional migration routes of wild elephant herds too. Tell-tale signs of an elephant herd passing through the border fence under construction. 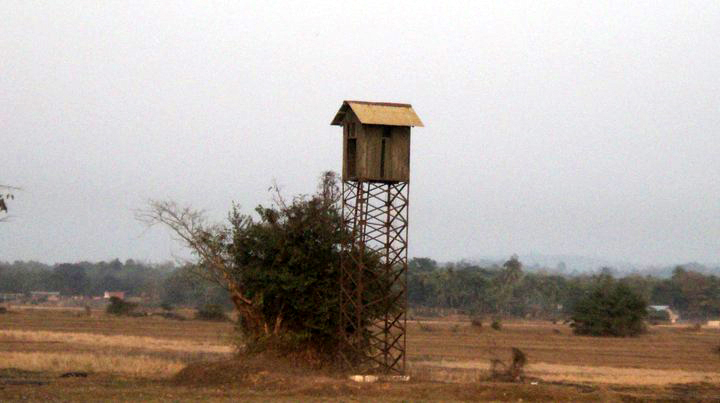 Life in a Border Observation Post (BOP) can be austere and tedious. After raising the tricolour at a BOP. 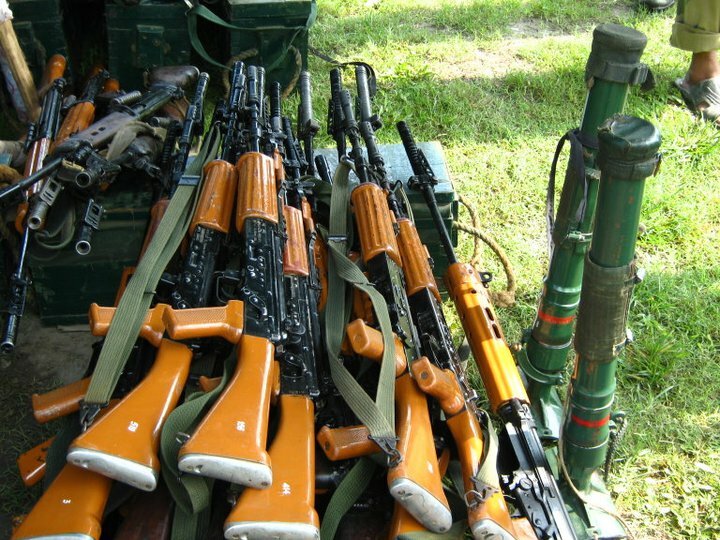 INSAS Rifles and 51 mm Mortars being left stacked before a live fire exercise at a firing range. 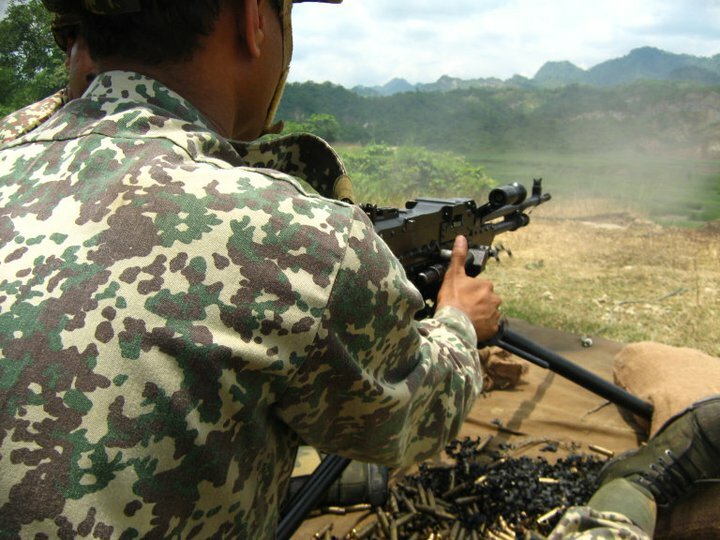 A 7.62 mm Medium Machine Gun on a tripod at the firing range. A live fire exercise in progress. 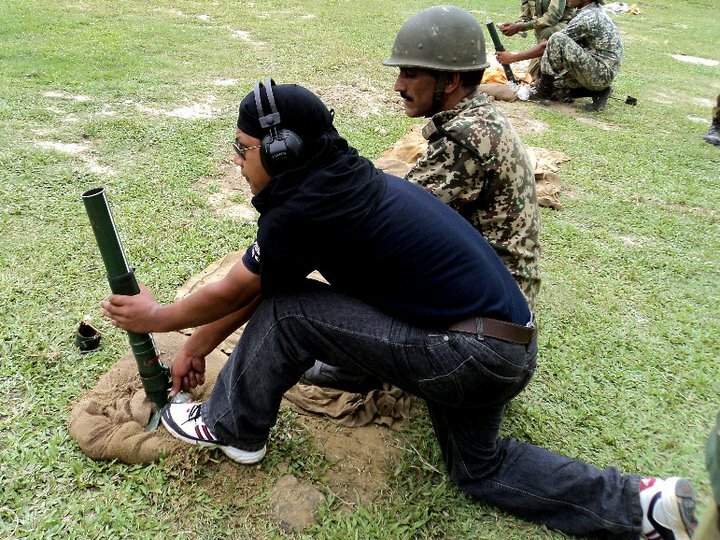 An officer in civies firing a 51 mm Mortar. 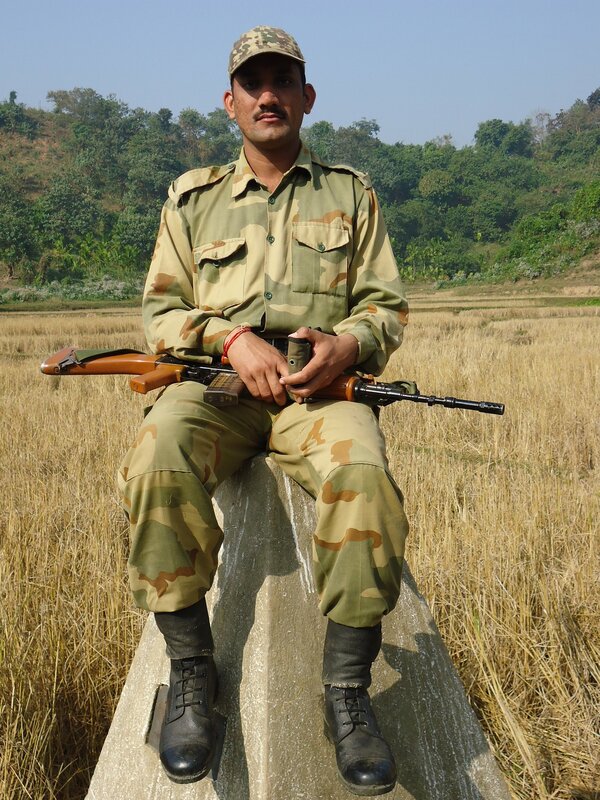 Often deployed for counter-insurgency operations, BSF officers and men are trained in handling explosives and defusing IEDs. 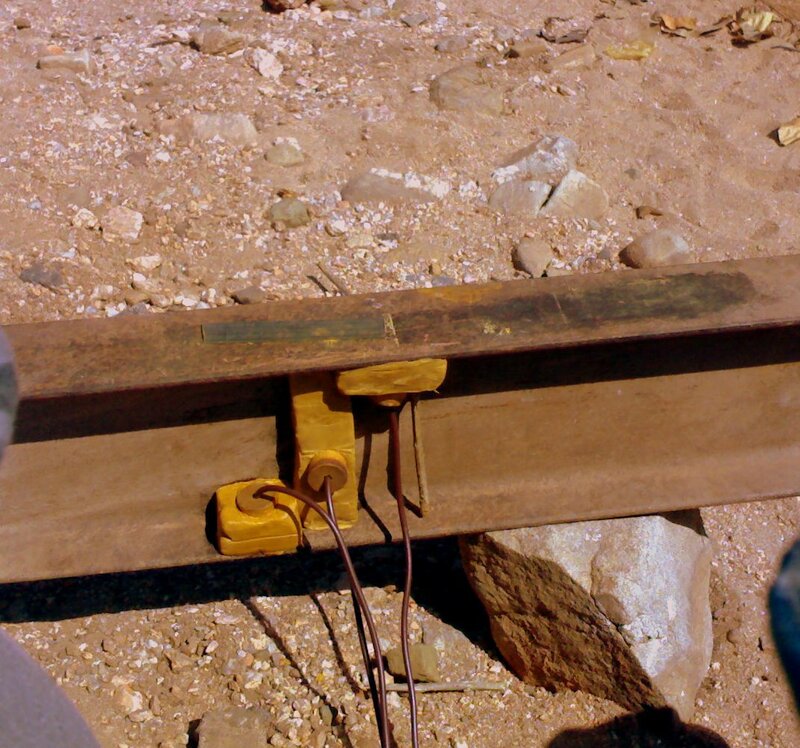 Here is how an IED of blocks of plastic explosives/TNT with detonators inserted into the blocks, attached to a railway track. 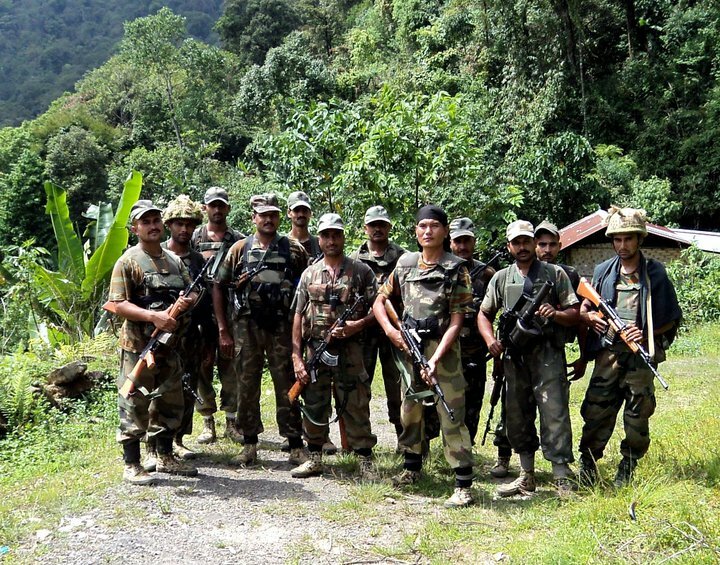 Border Security Force soldiers during an exercise in a neighbouring country. DIG of Tura Sector, G.S. 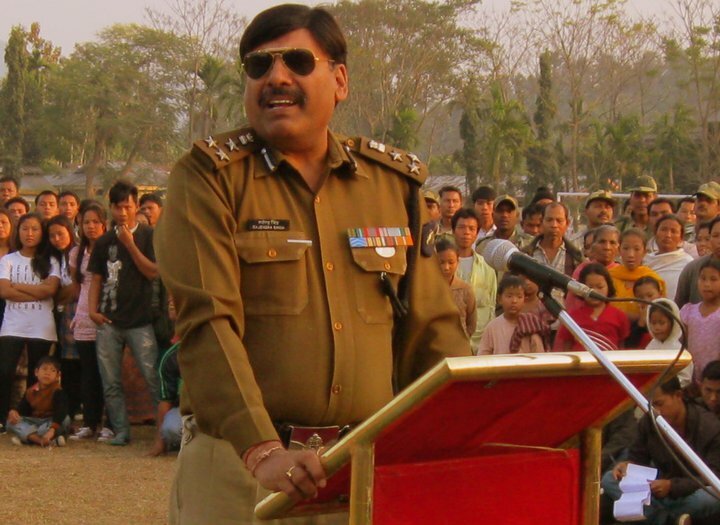 Choudhary at a public function to normalise community relations after a flare up between Garos and Rabhas in Assam Meghalaya border earlier this year. A prize and a warm handshake for a tiny participant. Addressing the public. Sadbhawana is taken seriously. 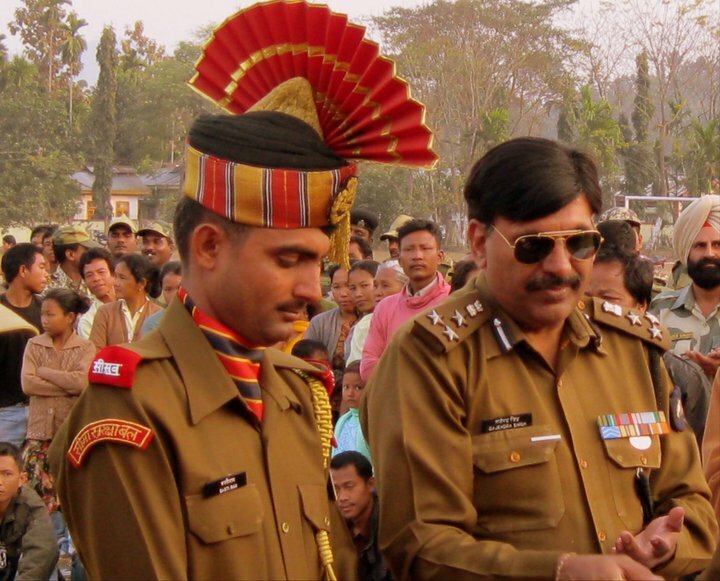 Mutual visits by Border Security Force and Bangladesh Border Guards to their counterpart’s Sector HQ are common. 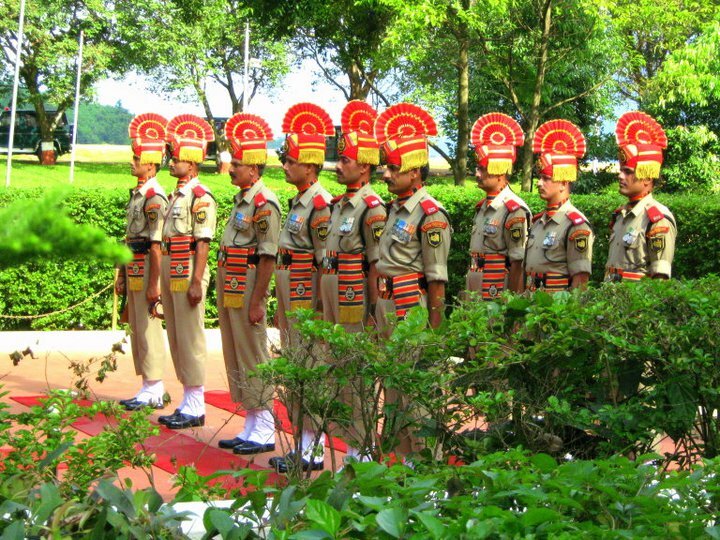 Here is a BSF Guard-of-Honour awaiting arrival of a high official of the Bangladesh Border Guards. 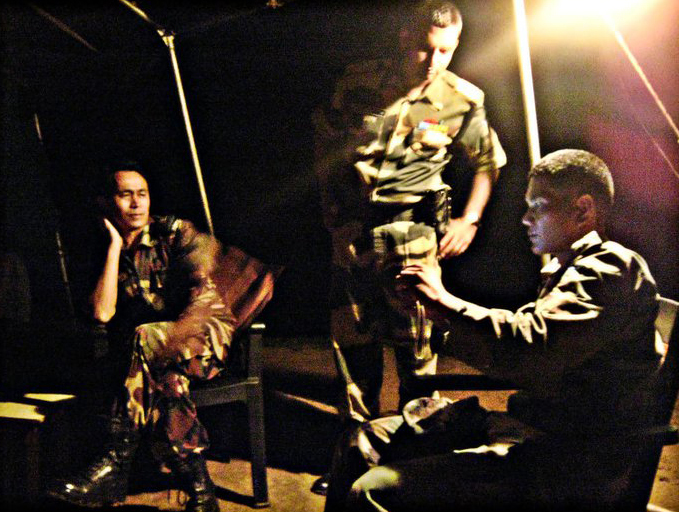 It must be noted that the Bangladesh Rifles, after its infamous mutiny, was re-raised as the Bangladesh Border Guards. 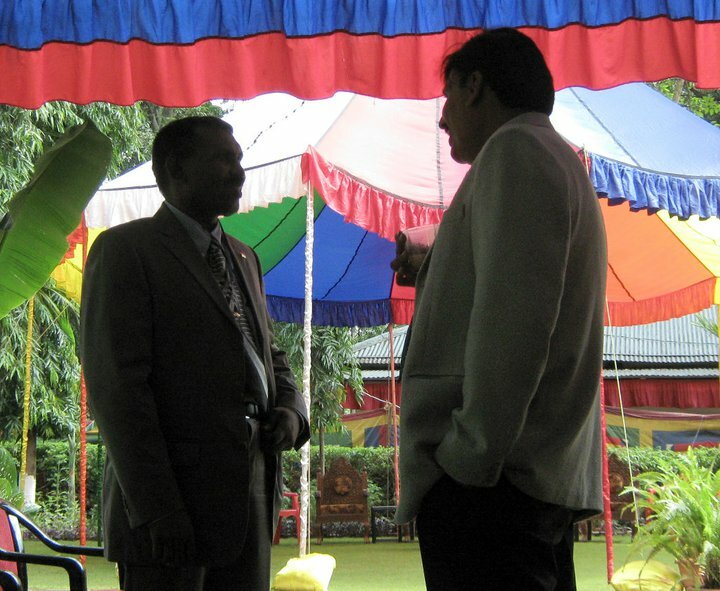 Sector Commanders of each force in conversation. A visit to a counterpart’s Sector HQ is also an exercise in protocols and customs. 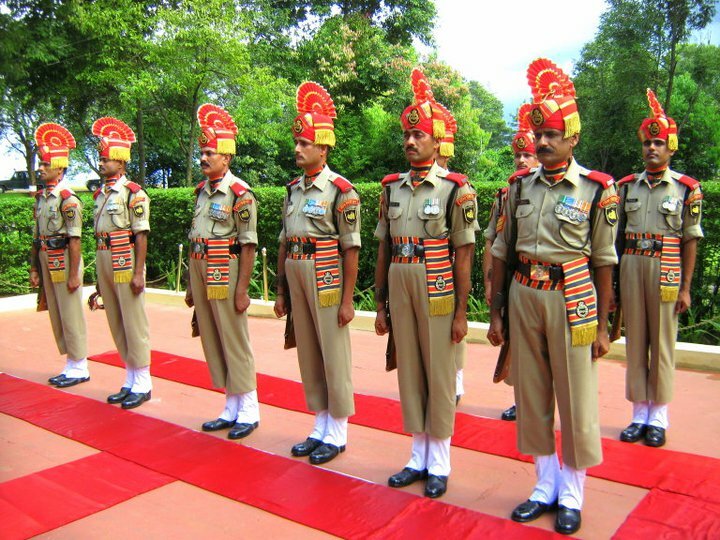 The sentinels of our borders, resplendent in their ceremonial regalia. An officer and a gentleman, and an avid photographer too. Posing here for the camera. All the photographs featured here have been taken by him. Can something be done about wild animal migratory routes/movements? 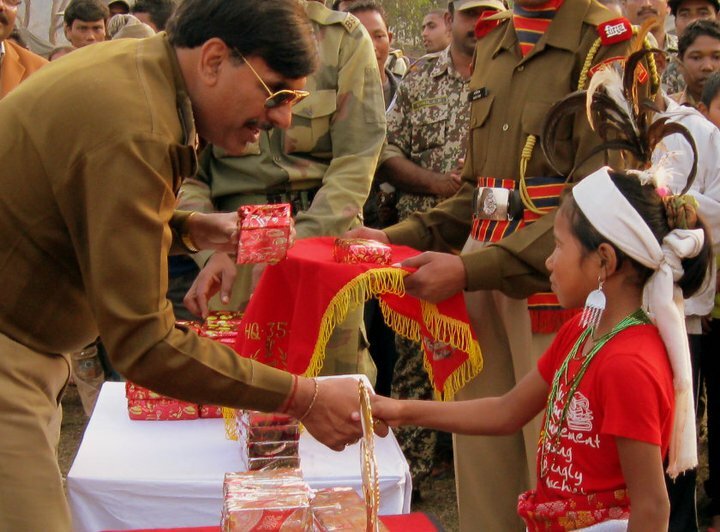 The security forces, the tribals, the local officials, the animals … it all just seems so poignant. never forget that border can divide piece of land not the cultures .language or the ethinic connections that border people are sharing. The Khobdagade Row: Will Pragmatism or US Arrogance Decide Course of Action? The Incredible Dynamics of Narendra Modi’s Airlift from Uttarkhand.